I'm pretty sure Wainwright woke up in a cold sweat last night, dreaming about walking in another run. Simply put, he was a disaster on the mound yesterday. It was pretty obvious from the first inning that Wainwright was intent on hanging himself, and the Braves hitters kept gleefully handing him rope. 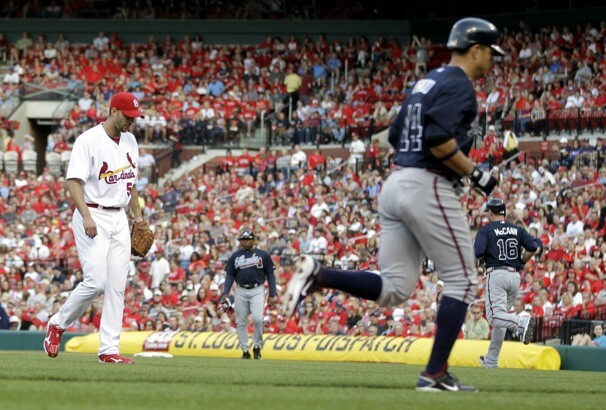 After only 4.1 innings giving up 9 hits, 5 runs, and 5 walks, Wainwright gave way to to the Cardinals bullpen. Too late! The damage was already done, and Beachy wasn't going to let any of their hitters launch them back into the game. Four Braves had a multihit game: Bourn, Uggs, BMac, and Rev. There were 13 hits and 7 walks in the game for 20 baserunners. Everybody was getting in on the act. Everyone except Jason Heyward. Somehow amidst all the contagious offense, Jason managed a bagel 0-5 night with 4 Ks. Now, if you're going to have 4 Ks on the night, I'd prefer it to be in a Braves win, and I'd certainly prefer it to be on the heels of a game-winning home run from the night before. So, he gets cut some slack for being a turnstile yesterday. Everybody gets one. So who won the MVP from yesterday? I think it would be a crime not to give it to Brandon Beachy for his performance. Not only did he go 6 innings only giving up 2 hits and a run, but he also managed to rake home an RBI single in the 5th. I love it when pitchers help themselves. Now, I do have to mention that Beachy also walked 4 guys, and that was the reason he gave up the only run in the 6th. However, after a visit from Roger with the sacks packed, he got Freese to rap into a rally-killing double play. That pretty much put the Cardinals to bed for the game. Defensively, the Braves were fairly solid. The outs for the game were 10-8-9 ground/fly/K, so I like that we were keeping the ball out of the air against a hot hitting club like the Cards. I do want to note that I'm getting a little tired of Dan Uggla short-arming balls out there at second. Freddy couldn't bail out Uggla in the 4th when he short-hopped the throw on a double play turn. Luckily nothing came of the runner advancing to second when the ball went into the stands, but Uggla now has 6 errors on the year. If it wasn't for Freddy's dig in the 6th on another double play poor throw, it could have been 7. So why am I upset if we won? Because Uggla right now is the WORST fielding second baseman in the NL. He has 1/3 of the errors on the team for the year. Let that soak in. Without Dan Uggla's bad throws, we'd be #2 in the MLB in fielding instead of #14. That's unacceptable for me, because I know that kind of stuff costs you games over the season, and I hate that it's attributable to one guy. Clean it up, Popeye. Moving on to tonight, I said in the preview that winning a series were be HUGE, and we've already done that. So I say why not go for the whole banana? We're in the Cardinals' heads right now, and although Lynn has been red hot, he's done it against sub .500 ball clubs. We're anything but subpar at the plate. We're the #2 offense in the NL, averaging 8 runs a game in this series. If we bring the thundersticks one more time, we can get a little payback on the Cards for last season's painful sweep. I love payback!